Lewistown, She is a Changing! Lewistown was just voted one of the happiest places to live in Montana. Surrounded by four mountain ranges and one the purest sources of artesian water in the West, residents say their quality of life is one to be coveted. Besides the big open sky, the slow pace of life appeals to most who reside here. Still, Lewistown, she is a changing. Most notable are the upgrades being made to downtown businesses. It is impossible to miss the construction happening all around the downtown area. Don’s store, 120 2nd Avenue South, a local icon of Western wear and outdoor sporting goods since 1947, closed its doors this spring to the surprise of the community. The long-standing business has been purchased by the Tognettis of Lewistown, who have owned The Sports Center on Main Street since 1946. They are set to move their business into the new space by fall. Theo and Lisa Wright are renovating the Reids building, also known locally as the Powers Mercantile, at the corner of 3rd and Main. It is made of iconic Croatian stone crafting. Benchmark Masonry traveled to Chicago to learn how to restore the old stone to its former beauty. The work is coming along and is visually quite appealing as well, as all new windows have been put into the space. The town stood still for a moment when, in late July, the boards were removed and the space revealed. Brand new windows that mimicked the building’s originals from 1901 add a modern yet retro look to the newly remodeled space. 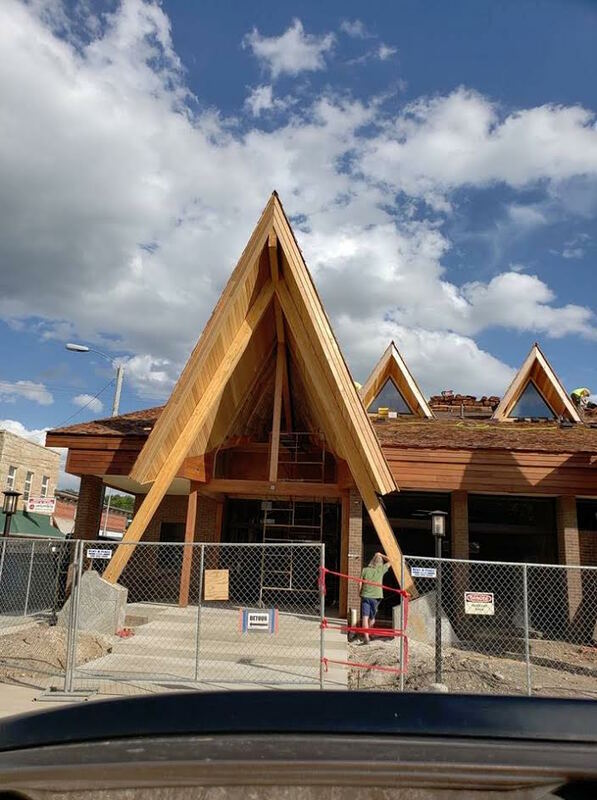 Bank of the Rockies, whose slogan is “The Oldest Bank in Montana,” is looking fresh and modern with massive upgrades. President of the bank, Brian Gatz, explains the remodel, at 401 West Main, began last August and should finalize this September. New construction features dormers, peaks, front entryway, and an additional second entryway on the west side. The interior now bodes a remodeled basement with two offices and a boardroom. The main floor remodel added two offices and a redesigned teller line along with all new flooring. Gatz explains that the Lewistown branch was the last to receive the remodel, which now has all of the Bank of the Rockies across the state looking the same. Just a block off Main the once austere Broadway Apartments appear to be getting some attention. The area around the building is tidy, and all of the windows have recently been boarded up with the indication, from the City, that work will begin soon on the next chapter in the life of the apartment buildings. Snowy Mountain Development Corporation (SMDC), a local Regional Economic Development Organization, has partnered with the DEQ and EPA for Brownfield funding to help make the space once more inhabitable. Across from the Courthouse, the blue building that served as a gas station for several generations and then finally as two separate cafés has been the beneficiary of the work that SMDC has done within the scope of local Brownfield Recovery. The County now utilizes the building for storage. Kathy Bailey, Executive Director of SMDC, says a six county region, including Fergus County, has benefited from approximately 2.2 million dollars’ worth in recovery assistance since 2010. The property attached to the north end of the Reids building, sometimes referred to as the LaFountain property, is also a Brownfield Recovery Project. Bailey explains that the recovery happens in phases. Phase 1 determines the historical nature of the property. Phase 2 deals with mitigation and abatement. If you are headed east on Main Street on your way into town, the missing Mountain View Motel might make you pause, as the skyline has changed dramatically. The motel, home, and the wall that featured the trout welcoming you to Lewistown are all in fact gone to make way for an incoming restaurant. The old Bar 19 on 1-191 has been a source of excitement as owners removed the entire building and a brand new bar and restaurant are in the construction phases. The owners say their plan is to continue construction without becoming heavily indebted to help insure the success of their new venture. The Lewistown Public Library got a fresh facade this summer as well. The understated building looks fresh and new, as do the original doors on the upper balcony that got a complete refurbishment. Fundraising for this and other projects were helped along by the Friends of the Library, a group of volunteers whose sole design is to help fund the needs of the library. They are well known for their Book Station, across the street from the library, which, open just once per month, helps rehome old books, as well as add an additional revenue source to their fundraising efforts. Donated books are left in the bin at the front of the library and then moved to the Book Station each week where they are sorted and shelved. While there was no new external construction done on The Art Center, there is much going on inside the distinctive building at 323 West Main. All new management brings a fresh eye to the inner workings of the town’s cultural mainstay. Summer programming for children was taught by artist, botanist, and Education Director Leah Grunke, who combined art and science for many teachable moments as the children caught bugs with homemade butterfly nets, created their own musical instruments and had a parade in the park while playing them, and grew their own gardens from seeds. Continued adult programming, in the evenings and on weekends, has seen a new hustle and bustle to the gallery, gift store, and educational center as Mary Callahan-Baumstark and Cassie Stone dedicate their youthful energy to bringing the arts and artists to the community as never before. Culturally speaking, Lewistown is the home to many talented artists and writers who are dedicated to their crafts. The Verbal Visual Exchange has become a popular event to bring the two mediums together. In early spring a word is chosen and given to the group of authors and artists. This year’s word is chaos. The artists then portrayed chaos in paintings and drawings while the authors did the same with words. A meet and greet was arranged by local author Maxine Melton and Cheryl Boyle. Each artist drew for a written piece while each writer wrote for an art piece.. The culmination of both art and writing will be displayed at Brooks Market and an evening of readings and viewings will be held in September. A magazine is produced each year featuring the culmination of the work. A new bakery will be taking the place of The Main Street Bistro at 122 West Main. New owners Dorothy and Leroy Swanson will be opening Parr Creek Bakery this fall. Dorothy has become well known for her custom cakes in the area, as well as being a busy baker for the community. Her cakes have been featured in magazines. She is also an instructor and hopes to utilize the new space to continue educating her dedicated students on cake decorating. The bakery will feature baked goods, soups, and sandwiches. In the downstairs area of the new café, Shanna and Bryan Swanson will be opening Marigold Market, a consignment shop for home crafters of Montana Made products. Artists and artisans will be able to rent an affordable space in which to place their goods. So many more things are happening in the small community. It might be time for a weekend drive to Lewistown to check them all out.